The game of Checkers (called Draughts in England) is one of the world’s oldest intellectual pastimes. A game similar to Checkers was played by the Pharaohs in ancient Egypt. Similar games were mentioned in the works of the Greek writers Homer and Plato. In the 12th century the game was adapted to the 64-square chessboard. In the 16th century the game was changed enough that it was essentially the same as modern Checkers. Now Checkers has entered the computer age, adding an exciting new dimension to this ancient game. 1. Turn on the TV and set the volume at a normal listening level. Select channel 3 or 4 (whichever is weaker or not used in your area). 2. On the MC-10, select the same channel by positioning the CHANNEL SELECT switch (on the bottom of the computer) to the appropriate setting. 3. Set the antenna switch box to the COMPUTER position. 4. Turn on the computer. The POWER ON/OFF switch is on the right side of the computer. 5. 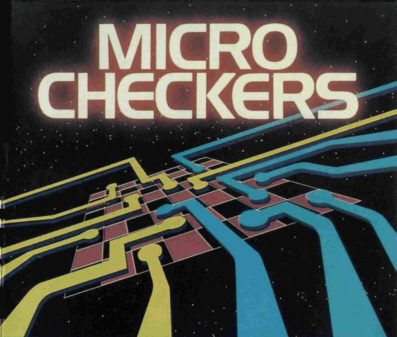 Place the Micro Checkers program tape in the cassette recorder. Set the volume of the recorder between 5 and 7. 6. Rewind the tape completely. 8. Press the PLAY button on the recorder until it locks. The letter S appears in the upper-left corner of the TV screen while the computer searches for, and loads, the program. 9. When the program has been loaded, OK appears on the screen. The checker board now appears on the screen. Note: If an OM ERROR occurs, turn the MC-10 off and then back on again to clear out all of the available memory. Restart at Step 6. The white squares are illegal squares and the computer does not let you move to them. The computer plays the green checkers and you play the orange checkers. To enter a move you must give the computer four coordinates. The coordinates tell the computer what square you are moving from and what square you are moving to. Be aware that the computer does not accept illegal coordinates including coordinates that do not fit the current position of the pieces. At the prompt FROM: ? type the two coordinates of the square you are moving from, separating the numbers with a comma. Then press [ENTER]. When the computer prompts TO: ? do the same for the square you are moving to. For example, assume your first move is from 6,2 to 5,3. At the prompt FROM: ?, type 6,2 [ENTER]. When the computer prompts TO: ?, type 5,3 [ENTER]. Note: Be sure to type both numbers separated by a comma before pressing [ENTER]. Otherwise, the computer prompts you for another input and ruins the display on the screen. To jump an enemy piece, enter the FROM coordinates as always. Then enter the coordinates of the square where your piece will land. The computer automatically removes the piece that was jumped. The computer then prompts you for another TO square. If you have another jump with the same piece enter those coordinates, If there is no other jump, type -1,-1 [ENTER]. This tells the computer that your move is over. If you do not enter -1,-1 to terminate your move the display on the screen may be disrupted and you will have to begin a new game. If you earn a king, the computer automatically crowns you. You then may move that piece forward or backward and jump enemy pieces in either direction. When all of one side’s pieces are removed or no piece can move, the game is over. If you win, the computer displays the winning message, YOU WIN!. If neither you nor the computer can force a victory, and the trend of play becomes repetitious, you should declare a draw game and begin a new game. Regardless of who wins, to begin a new game, press [BREAK] to exit back to BASIC. Then hold down the [CONTROL] key and without releasing it press . Then release both and press [ENTER]. The board reappears with the pieces reset for a new game.